Every other time you pick up the paper, it seems, you read the grim statistics of the opioid epidemic. The latest was research that showed 1.5 percent of all American deaths in 2016 were caused by opioids, which was worse than the casualty rate of Americans in the bloodiest year of the Vietnam War, which had a rate of slightly less than 1 percent. Numbers from the Centers for Disease Control and Prevention show that 64,070 people died from drug overdoses in 2016, a 21 percent increase over the year before. Approximately three-fourths of all drug overdose deaths are now caused by opioids. If nothing else, this parallel with Vietnam underscores the fact that we are in a war against opioids. Many users start with prescriptions for injuries or chronic pain. It becomes more serious when the prescriptions or insurance run out, sending people into the black market of heroin, Oxycontin and Fentanyl. Even with insurance, and the best intentions, patients can get hooked on opiates. “We’re in the middle of it all,” says Dr. Darryl Inaba, an addiction specialist in Medford. But what if you could cut out that dependency before it became too severe, or if patients could use marijuana to wean themselves off harder drugs? That’s an intriguing case for using marijuana as a substitute for opiates. 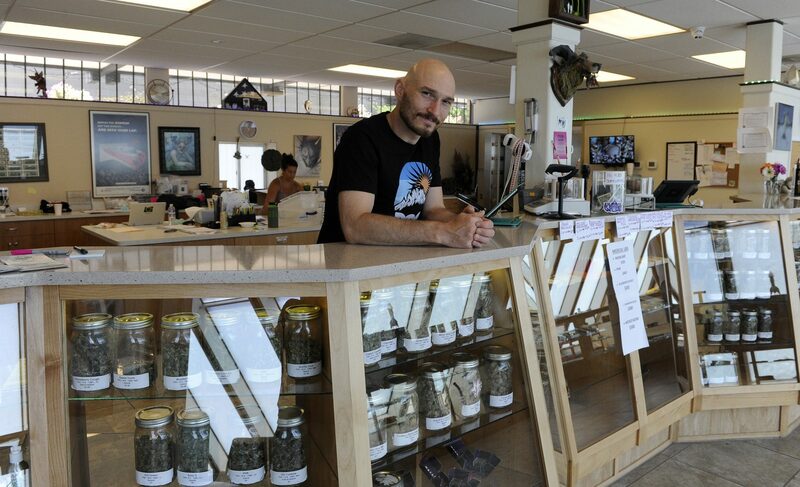 William Hays, manager of a dispensary called Wicked Flower Shoppe, across from Hawthorne Park in Medford, says he is walking proof that marijuana can be a key to overcoming addiction. His story is a fairly common one. He never used drugs, he relates, until the age of 30 when he injured himself on a construction job and suffered from excruciating back pain. He was given prescriptions for opioids and soon found himself hooked, which led to illegal purchases and all the misery that comes with addiction. But from there, his addiction path diverged. Hays says he was able to quit opioids with the help of marijuana. He started out with THC edibles “the strongest ones available,” he says, and then was able to cut down to lesser doses. He now works at the dispensary, surrounded by flowers, and it’s clear he’s enthusiastic about his role in helping others in similar situations. This initial withdrawal includes neuropathic pain and sleeplessness, and here is also where cannabis can help. Dr. James Shames, an addiction specialist who has been medical director/health officer for Jackson County since 2002, points to a study from the Veterans Administration that synthesized existing studies of the benefits and harms of cannabis. Shames says the studies concluded that there is “low strength evidence” that cannabis with precise THC-to-CBD content (1:1 to 2:1 ratio) has the potential to improve pain, spasticity and sleep in a select population (such as those with neuropathic pain). Despite the fuzziness of the studies, Hays’ experience seems to track with the statistics. Multiple studies have shown that pro-medical marijuana states have reported fewer opiate deaths, and there are no deaths related to marijuana overdose on record. A report in Drug and Alcohol Dependence found that hospitalization rates for opioid painkiller dependence and abuse dropped on average 23 percent in states after marijuana was permitted for medicinal purposes. Hospitalization rates for opioid overdoses dropped 13 percent on average. Another recent study showed marijuana has benefits on the front-end of usage, as well. The study, published in JAMA Internal Medicine, shows that medical marijuana laws and adult-use marijuana laws were associated with lower opioid prescribing rates (5.88 percent and 6.38 percent lower, respectively). Because over-prescription has been one of the drivers of the opioid crisis from the get-go, marijuana availability can make a huge difference in pain management and keeping patients safe. Marijuana may also be a boon to seniors. Not only does marijuana help with many of the aches and pains of aging, it can also be a practical alternative to opioids. Seniors want to engage in life, and not be zonked out on drugs, and marijuana offers relief for some types of pain without the heavy effects of prescription drugs. We’ve been told for years that marijuana is a gateway drug, but it may be a gateway to recovery instead. It is certainly worth checking out if you or your loved ones find yourselves caught up in an opioid crisis.